The Phongola Education Centre laboratory is a resource for the 32 high schools in the area. Schools can visit the centre to conduct the experiments required by the curriculum. The experiments help learners understand Science better and do better in their examinations. Teachers can also borrow science kits from the centre to conduct experiments in their classrooms. 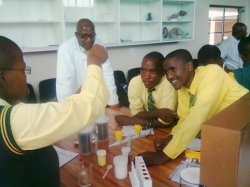 MIET AFRICA’s tutors and youth science facilitators also visit the schools to help them with these practicals.